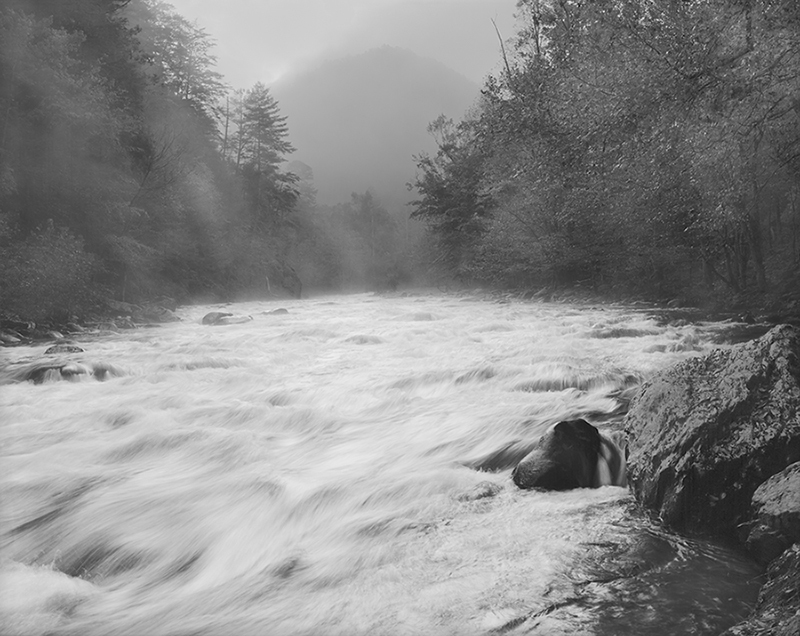 Clear, cool water works its way downhill to form the Little River in the Great Smoky Mountains National Park. A popular place to swim or fish in the Little River is located south of Townsend just inside the Park where the road forms a “Y.” The clear water attracts many visitors and I have enjoyed at least one swim there nearly every summer that I have lived in Tennessee. I was driving past the “Y” shortly after daybreak en route to another location in the Park when I had to stop to record a black and white photograph. The morning was quiet and mist rising from the river created an enticing mood that I could not resist. Before setting up my camera, I usually study a subject to identify a dominant theme for it. I decided that the theme of today’s photograph was moving water. Since water flows downhill, I tried to determine the best way to create a composition that would convey a strong impression of downhill flow. The first decision was lens selection and I chose a slightly wide-angle 120 mm lens (150 mm is “normal” for a 4inch x 5inch camera) to allow the camera to be placed close to the river and low to emphasize the water and help reveal the geometry of its surface. A longer lens would have required camera placement further from the water and that would have “flattened” the river’s surface so its geometry was not so obvious. To appreciate the importance of camera placement, note the visually weak flow patterns farther from the camera upstream compared to the visually powerful flow patterns close to the camera near the bottom of the image. To further emphasize water flow, especially downhill flow, the composition included decidedly “unflat” flow geometry close to the camera where water moved over rocks and then dropped sharply lower. Selecting an “unflat” area near the camera emphasized the visual importance of the area and strengthened the photograph’s theme of water flowing downhill. That area occupied the lower left quadrant of the image and played a key role in communicating flow. Positioning the area at the image’s lower left quadrant also helped move viewer’s eyes down and left to emphasize the river’s flow direction from top-to-bottom and right-to-left. The large brightness contrast of the scene presented a photographic challenge. The sun was located just below the mountain crest near the top of the image so the sky was quite bright compared to trees on the shore which were illuminated only by dim morning light. If the large contrast was not accounted for during image acquisition, the bright sky and/or dark trees would be blocked white or black without texture and the photograph would be unusable to me. Contrast had to be reduced on the film to obtain detail in both bright and dark areas. One advantage of black & white film is having tried-and-true techniques to handle challenging scenes like this one. The most common approach to reducing high-contrast at a scene is to increase exposure and decrease film development time. I acquired a few light meter readings and placed dark trees on Zones III-IV (dark with good detail – slightly darker than middle gray) and the bright sky fell on Zone X (pure white with no detail). Normal development of the film would have produced good detail in the dark trees but the sky would have been blocked white with no detail. Bright, featureless sky would have detracted from the soft, early morning mood that I desired. Consequently, I wrote N-2 on the film’s exposure record to instruct me to decrease film development time enough to darken the bright sky two f-stops. N-2 development would move the bright sky from Zone X (pure white with no detail) to Zone VIII (bright with slight detail) and create a film that was more consistent with the soft mood of the scene that I desired. A shutter speed of 1/4 sec was selected to blur the water enough to provide a feeling of movement but still reveal the water’s flow patterns. This shutter speed required an f-stop of f/45 which produces a substantial depth-of-field with the 120 mm lens that I was using. To ensure that adequate sharpness was obtained through the whole scene, however, I took advantage of the basic controls offered by view cameras. I tilted the lens slightly forward and swung the lens slightly to the left to position the slice of sharp focus closer to where it was needed in the scene. I was ready to make an exposure but still had to deal with small tree branches which hung in front of the camera. I used a stick to pull branches away from the lens as the camera’s cable release was tripped. One exposure was made using Kodak Tri-X 4inch x 5inch negative film. Previewing the 4inch x 5inch film on my drum scanner showed that the old, tried-and-true technique of increasing exposure and reducing film development handled the scene contrast quite well. The film showed good detail in the dark trees and slight detail in the bright sky. The preview showed that image tones were pretty close to my targets but I thought the mood could be strengthened by slightly lightening dark tones of the trees and slightly darkening bright tones of the sky. One of the major advantages of a Howtek drum scanner operated with Digital PhotoLab software is the ability to adjust scanner hardware prior to scanning. This is a huge advantage since one can obtain better image tones in the initial digital file that is obtained by scanning. In contrast to this, most other scanners acquire an image with less optimum tones and then “fix” them with software after scanning has been completed. I instructed the scanner to make the desired hardware adjustments and then acquired a high resolution digital file at my usual resolution of 5,000 ppi and 16-bit pixel depth. The digital image obtained directly from the scanner without editing is shown below. Careful examination of the digital file with PhotoShop showed that the combined actions of (a) increased exposure & decreased film development and (b) adjusting scanner hardware prior to obtaining a digital file from the scanner, produced a digital image that was moody and had tones which were close to those that I desired even though the scene contrast was quite challenging. 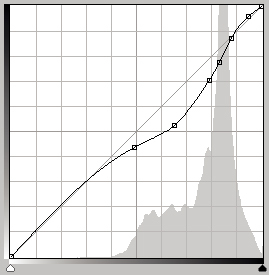 The histogram of the digital file from the scanner is shown below. Dark-to-light tones of the histogram are displayed from left-to-right. The histogram shows that pixels covered the full range of gray tones (0-255) and pixel tones were distributed in three main groups. A broad group of peaks on the left represented dark pixels of the trees, a broad group of peaks in the middle represented midtone pixels of the water and a sharp peak on the right represented bright pixels of the sky. The first two groups overlapped considerably but pixels in the sharp peak were isolated tonally from the rest of the image. This meant that an opportunity existed to modify the bright sky without affecting tones of the the dark trees or water. I pondered the act of modifying sky tones in terms of the photo’s theme. Since the dominant theme of the photograph was water flowing downhill, I thought that visual attention of the sky should be decreased to reduce its competition with the water. That is, I wanted to reduce the tendency of the sky to pull viewer attention from the water toward the top of the image. On the other hand, the sky needed to remain bright enough to contribute to the quiet mood of early morning light. I wasn’t sure how much change was needed and decided that the best approach was to decrease the sky’s contrast slightly but try to increase the presence of the rising sun. PhotoShop’s Magnetic Lasso tool was used to select the sky and then a Curve adjustment layer was opened for the selection. The Curve’s user interface for the sky is shown below. Note that tones progress from light-to-dark beginning at the lower left corner. 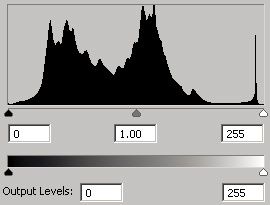 The histogram for the sky shows that pixels ranged from nearly middle-gray ( gray level = 130) to pure white (255). The tall peak near the brightest end of the histogram indicates that many pixels in the sky have tones that are very bright but not pure white. 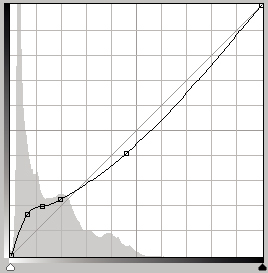 The original linear curve (light gray line which extends from lower left to upper right) was adjusted in three curve segments independently. Darker pixels of the sky (gray levels 130-175) were brightened by bending their curve segment downward, intermediate sky tones (gray levels 176-245) were darkened by bending their curve segment upward, and the brightest pixels near the rising sun (gray levels 246-255) remained nearly unchanged. The image below shows the result of the sky adjustment. When this image is compared to the previous image, one can see that visual attention commanded by the sky was reduced moderately so viewer’s eyes were pulled from the water less strongly. However, the goal of strengthening the sky’s contribution to the quiet mood of early morning light was not achieved well and needed more attention later. Next, attention was turned to the most important area of the image – water. The overall editing goal for this area was to impart a more dynamic feeling to the water, especially the feeling of downhill flow. This was accomplished in two steps. First, water was selected with PhotoShop’s Magnetic Lasso tool and a Brightness/Contrast adjustment layer was opened for the selection. Its user interface is shown below. Brightness and contrast were both increased considerably by moving the Brightness slider from 0 to 50 and the Contrast slider from 0 to 71. Comparing the previous and following images shows the result of brightness and contrast changes to the river. The second way which the feeling of downhill flow was strengthened involved editing near the photo’s edges. I often burn edges of photographs slightly to keep viewer’s eyes from falling off the edges and nudge eyes back into the image, as do many photographers. However, a different approach was taken for today’s photograph since it was beneficial for viewer’s eyes to fall off of the photo at its lower left and bottom edges to support the notion that river flow continues downstream beyond the area captured by the camera. Local burning and dodging were performed on the left and bottom image edges to help move viewer’s eyes beyond these edges. Burning and dodging also were performed further from the edges where water runs toward the lower left corner and drops substantially after flowing over rocks. “Energy” was added to the downhill drops to draw attention to them and carry eyes toward the photo’s edge. 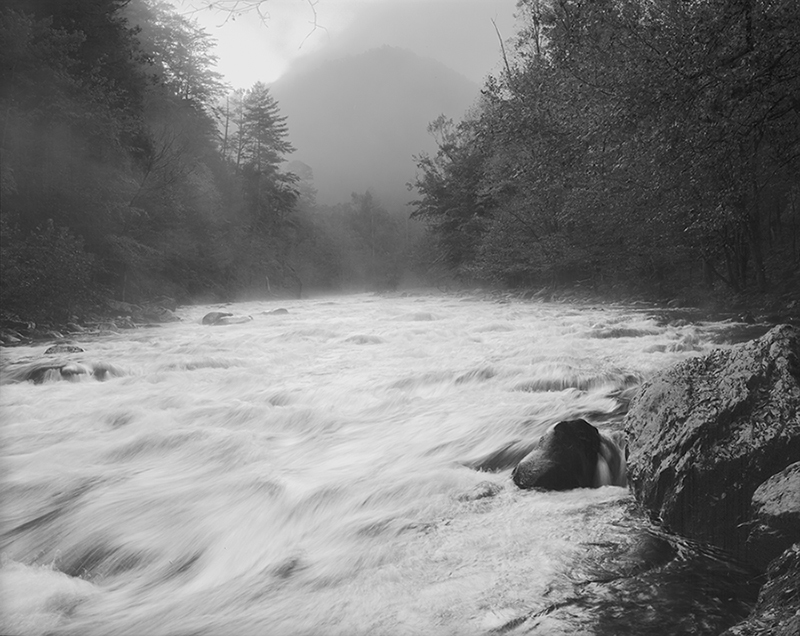 In conjunction with the previous water edits, a few trees, rocks and mist near other image edges were burned darker to turn the eye inward toward the river. This combination of edits pushed the eye from land, into the river and then off of the photograph at the left and bottom. Comparing the previous and following images shows the effectiveness of the edits. The overall result was river flow that seemed more dynamic and felt more like it flowed beyond the camera’s view. However, some of the edits may not be discernible in the tiny web images provided here. After water tones were edited, the large rocks near the lower right image corner looked too dark and heavy. Consequently, they were selected with the Magnetic Lasso tool and a Curve adjustment layer was opened for the selection. The Curve Adjustment user interface for the large rocks is shown below with tones that progress from light-to-dark beginning at the lower left corner. The histogram shows that the large rocks exhibited gray tones which ranged from pure black to nearly middle-gray. The linear curve was bent downward to brighten most of the rock areas although the darkest pixels were darkened even more to retain a solid feeling for the rocks. A comparison of the previous and following images shows the effect of the curve edit for the rocks. Finally, other areas of the photo were retouched using PhotoShop’s Healing, Burn and Dodge tools. I was disappointed that small tree branches were captured in the bright sky even though I tried to pull branches out of the camera’s field of view during film exposure. However, quick action with PhotoShop’s Healing Brush tool removed the distracting branches from the image. The sky was darkened slightly with the Burn tool except for the brightest pixels near the rising sun. This increased the presence of the rising sun and strengthened the sky’s contribution to the quiet mood of early morning light. Several of the dark trees were brightened with the Dodge tool. Areas of mist rising from the water were brightened with the Dodge tool. The area of dark water near the lower right corner was brightened to further reduce the weight of that image corner. The final image with all retouching edits is shown below. I have printed this image at several different sizes and it looks good at nearly any size although larger prints (e.g. 24 inch x 31 inch) look more impressive than smaller prints. The subject of this photograph was water of the Little River flowing downhill during the early morning hours. I believe the image does a good job of communicating that subject and think the lower left quadrant of the image plays a key role in communicating the feeling of downhill flow. Any comments you might have about the image, the photographic approach used for it, its composition, or image workup will be appreciated. For a slightly better view of this photograph, visit here.